"I was raised to marry a monster." Okay, I want to be totally candid here: Right before I cracked open Cruel Beauty, I read Hunted by Meagan Spooner and absolutely LOVED it. 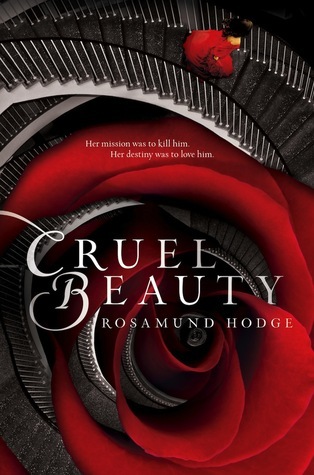 Since both books are retellings of the Beauty and the Beast story, I was a bit worried that Cruel Beauty would fall flat in comparison to the perfection of Hunted. However, this adaptation of the story could not be more different. The "Beast" of the story is not an animal at all, and the world in which Nyx lives is nothing like I expected. There's even a mixture of Greek mythology and tales of ancient Rome. I can barely even call it a Beauty and the Beast retelling, aside from the whole prince under a spell and captive woman concept. "Demons are made of shadow. Don't look at the shadows too long or a demon might look back." We are thrown right into the story. Like, by page two, Hodge is explaining demons and Nyx's predicament. I was surprised by the lack of buildup before the story really began. Nyx has been betrothed to a demon prince, whom she must kill after marrying. Her twin sister, on the other hand, gets to live a life of peace and safety, and Nyx hates her for it. It does feel a little like info-dumping, but I grimaced and made my way through it. I immediately disliked Nyx: she was selfish and unforgiving, and even though she was going through with a horrible (potentially deadly) wedding, I wished she wasn't quite such a spiteful character. She also struck me as a little too brash and sarcastic at points. Like, half of the time she's quietly plotting and maintaining her cool. Then, randomly, she would try to kill the lord with a fork. She made no sense sometimes. "I'm the evil demon lord. I know it's not a compliment, but I do like a wife with a little malice in her heart." Also, what the heck was with her and the Gentle Lord's first meeting? Such a strange meet cue, honestly. I was just sitting there like, "Are you kidding me? She first meets the fierce demon prince because he fell asleep on her chest while she was napping??" And THEN I found out the guy's name is Ignifex, which might be the least romantic/strangest name for a romantic interest that I've ever encountered. The combination of different myths was actually pretty cool. It's like Hodge took pieces of Rumpelstiltskin, Beauty and the Beast, Pandora, and others, then mashed them all together. It is definitely not just a Beauty and the Beast retelling. In ways, the story also strongly reminded me of an Alice in Wonderland retelling, with a maze of doors and an overarching sense of madness. Speaking of madness, some parts of the book were so strange that I found myself confused about settings and actions. I was especially lost toward the end of the novel. Seriously, I don't think I could tell you why/how things ended without confusing myself even more. I knew this book was going to be a story of insta-love. I heard countless other bloggers say so, and I didn't doubt it. While it wasn't the most absurd romance I've encountered, it definitely could have been developed better. I mean come on, the guy is the enemy she's been trained to hate since she was nine. It takes more than like 200 pages for someone to overcome those kind of emotions. "Why, is he scared of the dark?" "Like all monsters. Because it reminds him of what he truly is." Okay I recognize that this is a terribly long, incoherent review of this book (if you can even call it a review). Let me sum up my thoughts on Cruel Beauty: Although it is an original adaptation of the Beauty and the Beast tale, and I liked the inclusion of Greek mythology, I found the novel to be a little confusing and strange. I think the awesome plot idea kept me reading, but the writing style and some of the character interactions kept me from ever really loving the story.